works for me and what doesn’t. may have heard before but they really work well for me so I’ll share them! it but I’ve found copying how others tend to use it doesn’t necessarily work for me. let it sink in, not cook; I then go over the top of this with my face powder. taking away from all the highlighting work I’ve done. girl so I stay away from creams and I have to set EVERYTHING. dry, once dried, the cakeyness is gone and I look natural again! spritz is a must have in my makeup collection. Mario Badescu Facial Spray with Aloe,Herbs and Rosewater. Good Brushes Are Important – When I first started getting into makeup I knew NOTHING about brushes so bought myself a cheap fake MAC brush set from eBay, the brushes were fine, I had no problem using them. I then bought myself a Coastal Scents brush kit which I enjoyed, then Real Technique brushes came out, I bought those too and instantly recognised the difference. Whilst my “MAC” brush set was good for the basics of applying eyeshadow and powder, for more advanced steps such as blending foundation/eyeshadow, contouring and highlighting a good brush makes all the difference! I adore my Sigma E40 for blending, my Real Techniques Buffing Brush for cream/liquid foundations, my Beauty Blender for blending foundation and my Real Techniques Powder Brush for setting. That’s not to say I do not love my eBay brushes as they really are great, but for specific uses sometimes it helps to really invest in a good brush! Expensive Doesn’t Necessarily Mean Better: Yes, we all like luxury including myself but most of the higher priced item that look pretty function the same as lower priced products, this is definitely something to note if you’re new to makeup. For instance my Tom Ford lipstick broke in half the second time I used it, my YSL bronzer isn’t as pigmented as I would like it to be, my MAC blush in Modern Mandarin is not pigmented at all for my skin tone, I was not a fan of the YSL Babydoll Mascara, I find my Urban Decay Ink For Eyes useless and the Giorgio Armani Luminous Silk Foundation that I bought oxidised like mad on me so I had to take it back to the store. Baring this in mind my Tom Ford lipstick is the only lipstick I own that has ever broken on me when using a light hand, my ELF Powder Bronzer is so pigmented I love it, my La Femme Blushes give you killer colour pay off in one swipe, I love my Maybelline The Falsies Mascara, one of my favourites, Makeup Revolutions Felt and Kohl is my go to liner and most days you’ll find me wearing my Sleek BB Cream. Don’t be enticed by a brand because of their name, shop around, read reviews and don’t be afraid to buy that dupe first, test that product out. Most Products Are Multi-Use: I remember being online when a blogger asked what are good products for contouring, a few suggestions had been made but no one had mentioned using an eyeshadow. I mentioned it and was brushed off by the blogger. This left me confused. What exactly would be the difference between using a contour powder and a matte taupe eyeshadow powder – size? Many makeup products can be used for many different purposes. 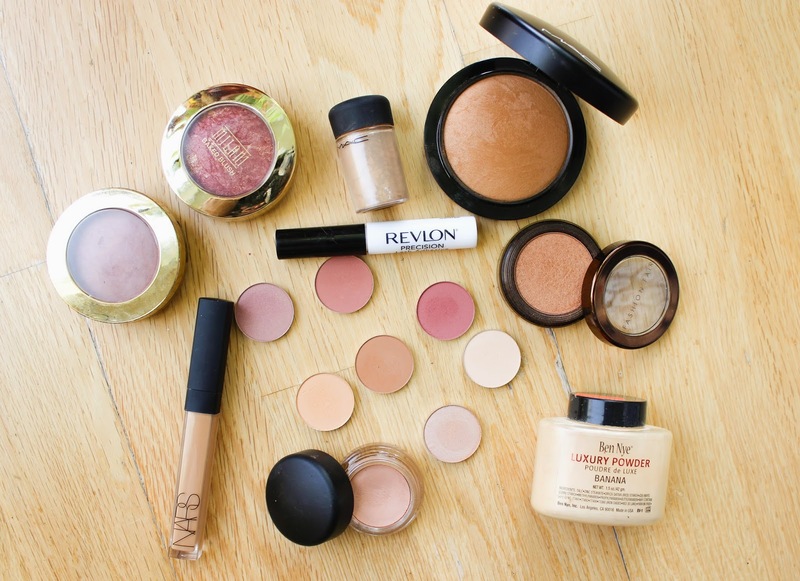 Blushers can be used as eyeshadows and eyeshadows can be used as blushers, highlighters and contour powders. Lipsticks can be used as blushers. Highlighters can be used as eyeshadows. Face powders can be used as bronzers and contour powders. The only thing you would need to watch out for is if products are safe for use around the eyes, mouth etc. I use a lot of my products for different uses, this is not only a space saver for my makeup bag it also helps me justify my new makeup purchase haha! And that’s it, my Five Makeup Tips! If you have some handy makeup tips that you swear by, please let me know!